The following content is a brief and unofficial prerequisites guide to setup, configure and test delivering virtual apps from the Microsoft Azure Marketplace powered by the Citrix Cloud XenApp Essentials Service prior to deploying in a PoC, Pilot or Production environment by the author of this entry. The views, opinions and concepts expressed are those by the author of this entry only and do not necessarily conform to industry descriptions or best practises. The views expressed here are my own and do not necessarily reflect the views of Citrix. It is a replacement for the deprecated Microsoft Azure RemoteApp (ARA) – https://blogs.technet.microsoft.com/enterprisemobility/2016/08/12/application-remoting-and-the-cloud/ (“…Support existing Azure RemoteApp customers on the service through August 31st, 2017..“) which provides simplicitic beauty of Microsoft Azure RemoteApp now with the “Secure by Design” enterprise security methodology, platform scalability with FMA in 7.x and HDX virtual app delivery protocol capabilities & power of Citrix XenApp. Introducing XenApp Essentials Service is a demonstration of the Service by Citrix. 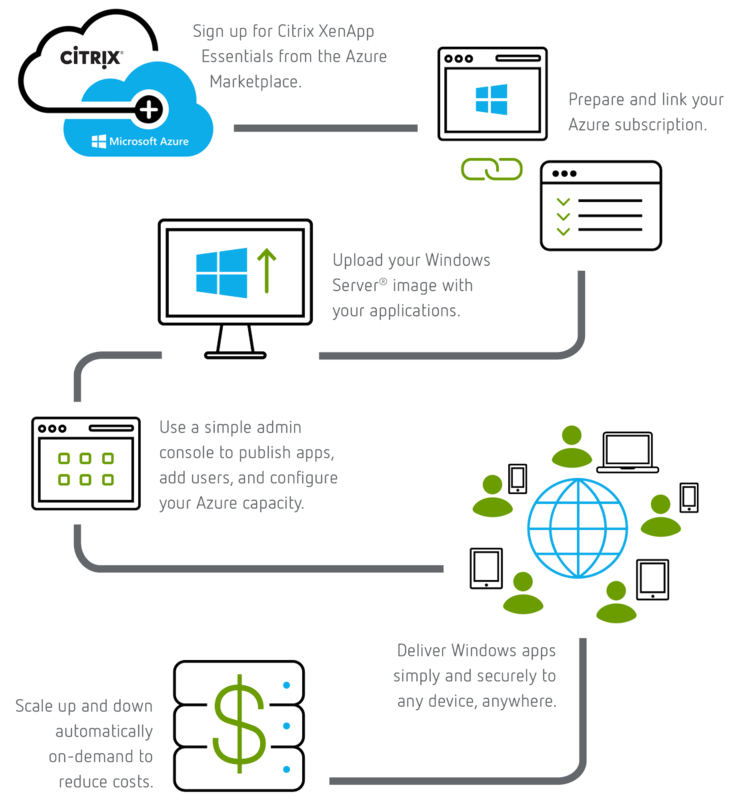 Extend the Microsoft RDS platform in Azure through Citrix solutions was a presentation at Microsoft Ignite 2016. 1. You’ll need an Azure subscription with a resource group defined with a virtual network. 2. Define your preferred Azure region which you can ref from – https://azure.microsoft.com/en-gb/regions/. 3. Decide on your AD stratergy which can be Active Directory sat in the Azure resource location using a min A3 Standard VM instance for AD or you can utilise “Azure Active Directory Domain Services” and eDocs suggested that you review – https://docs.microsoft.com/en-us/azure/active-directory-domain-services/#main prior to implementing AAD for the XA Essentials Services vs. traditional AD. 6. Only MCS based provisioning is support for public (Iaas) clouds and for this Service hosted by Microsoft Azure. 7. Subscribe to XenApp Essentials Service through Azure Marketplace at – https://azuremarketplace.microsoft.com/en-us/marketplace/apps/Citrix.XenAppEssentials?tab=Overview. The above is an graphic from the official XA Essentials Service documentation from Citrix eDocs at – http://docs.citrix.com/en-us/citrix-cloud/xenapp-and-xendesktop-service/xenapp-essentials.html and the below is my personal text based step by step summary explaining how to get started with the XA Essential Service powered by Citrix Cloud and Microsoft Azure based upon the Ignite session at – https://www.youtube.com/embed/Ck0mtVXqOuM. Please note that these steps can change as the service is delivered from Citrix Cloud which is a secure SaaS style evergreen control plane – http://docs.citrix.com/en-us/citrix-cloud/overview/about.html. 17. Users are now able to launch there HDX virtual apps secured by there organisations Cloud-hosted StoreFront FQDN which provides secure remote access via the NetScaler Gateway Service also review caveats re bandwidth through-puts below. The list of current know issues one are my ones to pay attention to most as of 04/04/2017 and a full list is available at http://docs.citrix.com/en-us/citrix-cloud/xenapp-and-xendesktop-service/xenapp-essentials.html so please check and read them all! 2. Users cannot launch and app if an existing RDS session is present on the XA VDA worker. 3. Machine catalogue failures may occur if deploying a VM instance size in a region that does not support that instance type any more. This entry was posted in Azure, Citrix, Citrix Receiver, HDX, HTML5 Receiver, Microsoft, Windows Server 2016 and tagged ARA, Azure, Azure Marketplace, Azure Marketplace XenApp Essentials, HDX, https://azuremarketplace.microsoft.com/en-us/marketplace/apps/Citrix.XenAppEssentials?tab=Overview, ICA, Microsoft Ignite, RDP, RDS, Remote Desktop Services, Terminal Services, XenApp Essentials Service on April 3, 2017 by lyndonjonmartin. The following content is a brief and unofficial prerequisites guide to better understand NetScaler Gateway Service from Citrix Cloud test delivering virtual apps and desktops powered by XenApp & XenDesktop Service prior to deploying in a PoC, Pilot or Production environment by the author of this entry. The views, opinions and concepts expressed are those by the author of this entry only and do not necessarily conform to industry descriptions or best practises. The views expressed here are my own and do not necessarily reflect the views of Citrix. The NetScaler Gateway Service is a simple, clean. effortless and but most importantly a powerful way to demonstrate the power of Citrix Cloud by providing secure remote access to your HDX virtual apps and desktops from your resources location over the internet (https) securely. While this service is very very powerful & simple to implement and use, you should under the keep in-mind that NS VPX/MPX/SDX is fully featured vs. the NSG Service which is focused on delivery of HDX virtual apps & desktops! So in summary when implementing service undering what is right vs. relevant for the customer needs and requirements is very important. 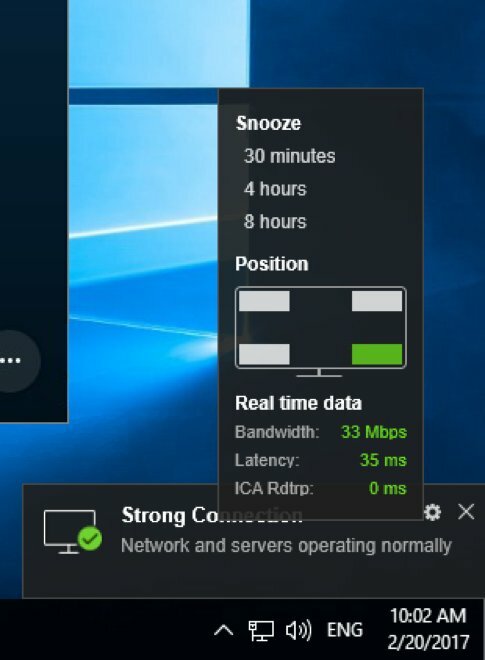 Finally you can read more about the service and its benefits at https://www.citrix.com/products/citrix-cloud/services.html. 2. Select to Manage your XAD Service which will take you to https://xenapp.cloud.com/. 4. Now Select to toggle “ON” and choose to use the NSG service (preferred for blog article only) or your own NetScaler (Unified) Gateway at your resource location and if you enable to the NSG Service you can choose to check the session reliability (2598) checkbox. Users connect to https://.xendesktop.net and then login using there AD UPN domain credentials e.g lyndon-jon@x1co.eu and the user’s credentials are encrypted through-out the login process. User’s can equally choose between using a full Citrix Receiver (HDX Optimisation Pack 2.x.n for offloading Skype for Business 2015-2016) vs. HTML5 Receiver (HTML5 compliant internet browser) experience by selecting their username in the top right hand corner and selecting to “Change Receiver” to their preferred choice of Receiver. It also important to set the correct +HDX Policy to get the best UX that is good and balanced (backend vs. network vs. client connected device) so I’d suggest that you implement HDX Adaptive Display v2 by selecting the following policy entitled “Use video codec for compression” and select the following option “For actively changing regions” and thereafter tweak the frame rate and adjust the Thinwire color depth support as described at http://docs.citrix.com/en-us/xenapp-and-xendesktop/7-12/whats-new.html#par_anchortitle_59c9 and you can also read more about benefits and a YouTUBE demostration on HDX Adaptive Display v2 at the following blog article I wrote in 2016 at – http://axendatacentre.com/blog/2016/10/01/foractivelychangingregions/. Please note that traffic flow is based upon the diagram avaiable at – http://docs.citrix.com/en-us/citrix-cloud/xenapp-and-xendesktop-service/netscaler-gateway-as-a-service.html as of Jan 2017. 1. User MUST login into cloud hosted StoreFront e.g https://.xendesktop.net. There credentials are securely handled please refer to – http://docs.citrix.com/en-us/citrix-cloud/xenapp-and-xendesktop-service/technical-security-overview.html to understand the traffic follow. 2. Once the user has authenticated successfully he/she can select to launch a virtual app or desktop. 4. Traffic is securely brokered to the Connector in your resource location that is severing up the user’s selected virtual app or desktop or both from the server or desktop VDA. 1. The Citrix Cloud NetScaler Cloud Gateway service on your Connector allows and provides the secure remote access feature of the NSG Service from your chosen resource location. I have written a blog article about the Connector services and leading best practises which you can read at – http://axendatacentre.com/blog/2017/01/27/understanding-the-citrix-cloud-its-services-architecture-connectors/. 2. To ensure high availability you should always deploy at a min a pair of Connectors within your resource location and increase the compute capacity of your Connectors as user demand increases initially and thereafter deploy another Connector based upon usage of service. 3. 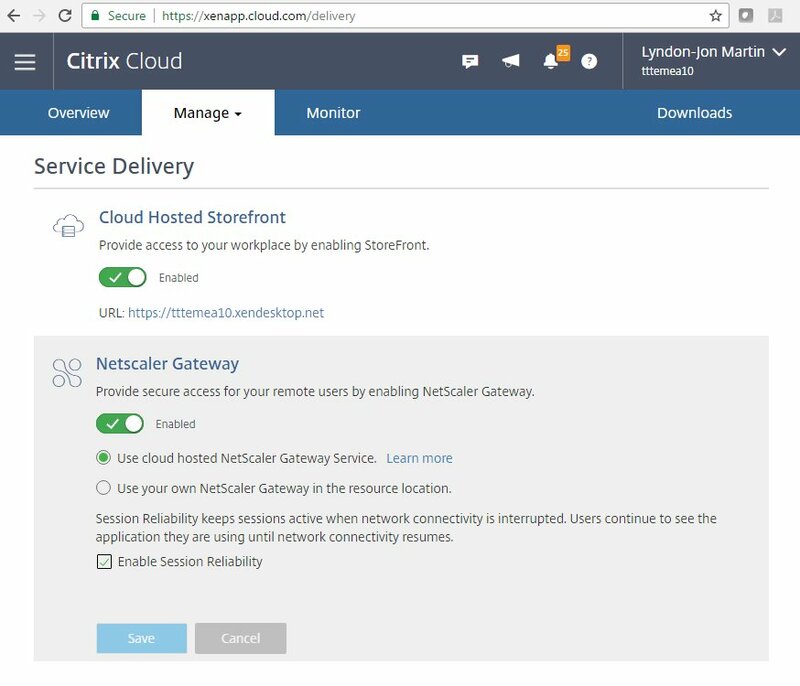 *To use the NSG Service you MUST configure to use the cloud-hosted StoreFront provided by Citrix Cloud under “Service Delivery” tab at https://xenapp.cloud.com/delivery. 4. The NSG Service only supports HDX Traffic only and the service is currently only available on Eastern, Western coasts within the USA and in Europe so for those users accessing virtual apps and desktops via the NSG Service outside of these geos or not in close proximity to an entry point will experience higher latency so tweak your HDX policy(s)+ accordingly or deploy a NS VPX in your resource location. 5. ICA files are STA signed the below example is a small snippet from my own PoC and testing*. I have also intentionally scrammed some of the unreliable text to :-). The NSG Service currently does not support and or is limited as of writing this blog article in Jan 2017 and based upon the embedded Twitter image – http://docs.citrix.com/en-us/citrix-cloud/xenapp-and-xendesktop-service/netscaler-gateway-as-a-service.html. Finally please remember that Citrix Cloud is consistently been updated and upgraded with new feature so please please refer to the online documentation and the service overview of Citrix Cloud even a day after posting the blog article as it may become out of date! You’ve been warned! 6. No support for Unified experiences (e.g Branding with your logo, colour scheme). 7. No support for Two Factor Authentication. 8. No support for authentication via outbound proxies for access outside of the resource location over the internet. This entry was posted in Apps & Desktop Service, Citrix, Citrix Cloud, Citrix Receiver, Citrix Workspace Cloud, CWC Connector, HTML5 Receiver, ICA Proxy, NetScaler, NetScaler Gateway, NetScaler Gateway Service, Remote Access, XenApp and XenDesktop Service and tagged Citrix Cloud PoC, Citrix Cloud Service, Deploy Citrix Cloud, Deploy Citrix Cloud PoC, Deploy Citrix Workspace Cloud, Deploying a Citrix Cloud - XenApp and XenDesktop Service PoC, HDX Traffic, https://apps.cloud.com, https://xenapp.cloud.com, ICA Proxy, ICA Traffic, NetScaler, NetScaler Gateway, NetScaler Gateway Service, NetScaler Gateway Service (NGS), NetScaler Unified Gateway, NSG, NUG, Secure Remote Access on February 11, 2017 by lyndonjonmartin.